What Keeps Small Business Owners Awake at Night? If you only pay attention to mainstream media, you might recall advocates for small business sounding like a broken record, constantly repeating the refrain of reducing regulatory burdens. But when New York City’s Small Business First initiative sought public comments last year from small businesses and the public on small business needs and priorities, only 17 percent pointed to reducing regulations. 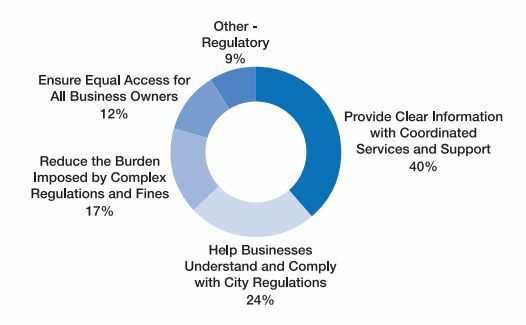 The rest pointed to more clarity, more support services, and more equity with regard to who can most easily access those support services to navigate the city’s 6,000-plus rules and regulations, and 250ish business-related licenses. So it makes sense that the Small Business First initiative is focusing this year on consolidating touch points and streamlining interactions between the city and its more than 200,000 small businesses. It’s the beginning of a $27 million investment by the city that will run through fiscal year 2019. “Small Business First is a critical step for our city to build a more diverse and inclusive economy,” says Mindy Tarlow, director of the Mayor’s Office of Operations. Up to 15 city agencies may be involved in the process of starting and running a business. There is currently no central location from which point small business owners or potential small business owners can access all of them. It’s not hard to imagine how this can be an issue for those in the outer boroughs of the Bronx, Queens, Brooklyn or Staten Island, farther from the city’s main government offices in Manhattan. The same could be said for recent immigrants; some are from countries that already have one-stop shops for registering a business. Currently, many useful services remain scattered across a hodgepodge of citywide websites. The city technically has a consolidated online portal for starting a business, as well as checking the status of various business permits. Building on that, Small Business First proposes to create the ability for small businesses to have an account on the platform, which would allow them to access records of inspections and initiate transactions without having to constantly fill out new forms (even online forms). Changes in laws and regulations affecting specific business types could generate emails or notifications directly to business owners with an account. Over at the NYC Business Express website, you can already create an account in order to pay violations, search city records, and get answers to questions about city rules and regulations. New York City’s Department of Consumer Affairs has its inspection checklists posted online, and occasionally advertises their availability in various places, including on public transportation. The New York City Business Accelerator office provides a range of free services to small businesses in food and beverage, industrial and retail, including pre-inspection consultations for businesses that are soon to open. Then there’s New York City Business Solutions, a set of free services offered by the NYC Department of Small Business Services, including financing assistance, legal advice, advice on city contracting, recruiting advice, or help with permits or licenses. It’s not immediately clear which website is best for any given small business, or how much overlap there is between these existing websites. Even with all of these, if a small business owner is looking to conduct all of his city government business online, there are potentially even more online portals to go through for things like paying taxes or reporting issues with sidewalks, streetlights or other infrastructure. Since releasing the study in February, there hasn’t been much news from the de Blasio administration about Small Business First. In May, Small Business Services announced a partnership with the Mayor’s Office of Data Analytics (MODA), to send trained client managers to neighborhoods across the five boroughs to provide businesses owners with targeted education based on data showing the specific business needs in a given neighborhood — including top violations, areas of non-compliance, new business growth data, 311 complaints and more. They started with 100 targeted businesses in a high-violation area in the Bronx. In addition, the de Blasio administration has reduced fines assessed to small businesses by half over the past year, while also cutting violations issued by a third. Maybe it was the summer malaise, maybe it was the Mayor’s much publicized fight with Uber, but there wasn’t much of a fuss raised over that seemingly important bit of progress.